Broken down in simple terms, organic search engine rankings are determined by how well a particular page on a website is optimized for the keyword phrases being searched for and how many relevant/authoritative backlinks are pointing to that page. SEO or Search Engine Optimization describes the techniques involved in optimizing the pages on a website so that they load quickly, can be crawled easily by search engines, fit perfectly with the search intent of it’s target keyword phrase and have authority (links pointing to them from other relevant high quality sites). In this chapter, we will show you the steps you need to take to make all the pages on your website search engine friendly and keyword optimized so that your site ranks at the top when your prospects are searching for information about your product or service. Before we jump into the heart of this chapter, let’s address somehousekeeping tasks. First, you’re going to be using our SEO planning template as your guide to optimizing the different pages of your website. You can access that template by clicking the link below. Better Rankings Starts With A Solid Plan. Click here to access the "On-Page SEO Planning Template" NOW! Next, you’ll need to setup Google Analytics to track performance and behavior of your website traffic and Google Search Console to check for crawlability and site performance issues as well as ongoing monitoring. Navigate over to Google Analytics and Google Search Console and follow the steps to setting it up for your website. Be sure to connect these inside Google Analtyics. Also, we will explore how and for what keywords your web pages are currently being optimized for. To do this you’ll need to download Screaming Frog, a website crawler, that allows you to crawl your website’s URLs and fetch key onsite elements to analyze onsite SEO. If you have a smaller site, less than 500 pages, the free version will work fine. For larger sites you might want to purchase a license to get a complete picture of your websites search friendliness. It’s a small annual fee and worth every penny. You will want to track your progress as far as technical SEO improvements and keyword rankings are concerned. For this effort, I recommend SEMRush which can handle both of these tasks and as you’ll see we use SEMRush a lot throughout this post. To crawl your site with Screaming Frog is fairly simple. Fire up your copy of the software, enter your URL in the address bar and hit start. Screaming Frog will simulate how a search engine would crawl your site and deliver the data from that crawl. 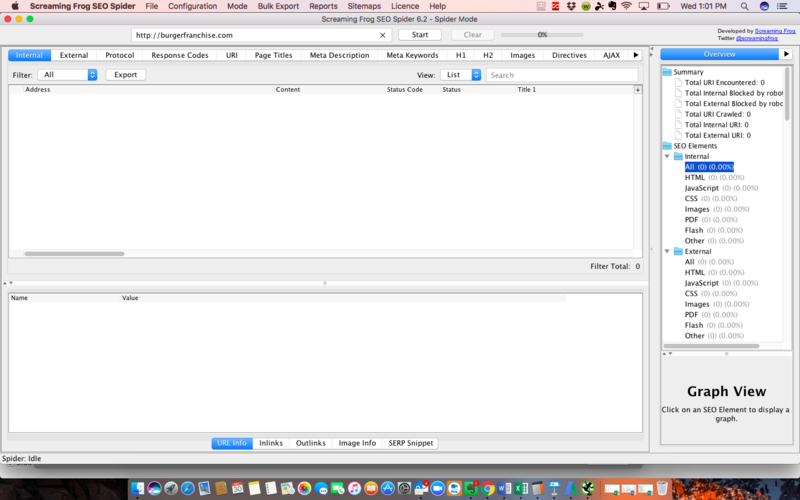 Export your results for a full list of your site pages. Some common issues to look out for are missing page titles and meta descriptions, duplicate page titles and meta descriptions, page titles over 70 characters and meta descriptions over 155 characters. Next paste the URLs, Page Titles, and Meta Descriptions into the SEO planning template under the columns “Current URL” “Current Title” and “Current Meta Description”. Exclude URLs for images, css styling, scripts, and other URLs that don’t look like basic webpages. 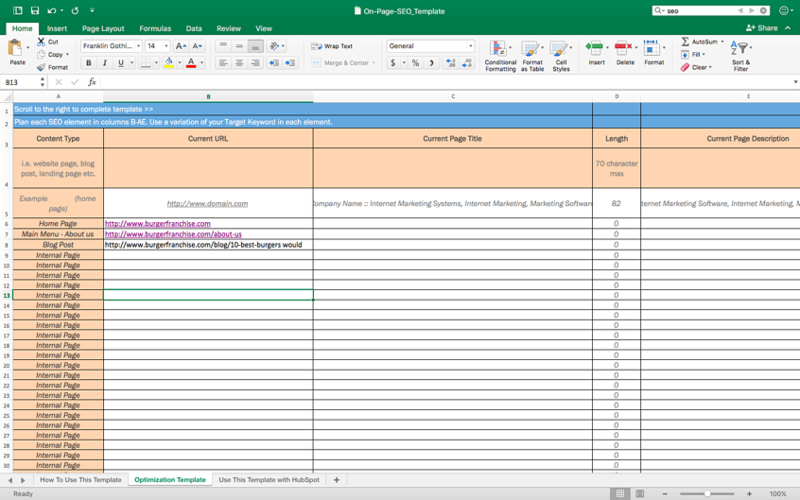 Organize these URLs and their data in the spreadsheet by defining what type of content and where on your website they currently sit under the column “Content Type” in the SEO planning spreadsheet. Now fill out all the remaining info for your current pages: What’s the purpose of the page? (will help match keyword intent with the content on the page) and Who is the target audience? (will help you create more personalized content). Do this for all URLs. You now have the foundation where you can begin your optimization. Let’s do a quick spot check to see if their are any major issues with the website. Make your way to google and type “site:yourwebsite.com” into the search bar. Do you see your website? Good, that means Google is indexing your site. Does the number of pages listed correspond to the pages in your SEO planning template? Good then that means your pages are being indexed. If you’re not seeing your website or your page count seems way off, most likely either your robots.txt file is blocking Google from crawling your website or your website has been removed for violating Google’s Webmaster Guidelines. Time to check your site speed performance. For this, I like to use a couple of different tools to get a consensus Google pagespeed insights, GTMetrix, and a chrome extension called YSlow. For Google pagespeed insights and GTMetrix, simply plug in the page you want to check and hit analyze. For YSlow, download the chrome extension, navigate to your website, click on the icon in your bookmark bar and hit run test. Each of these tools will give you a score and a list of things to do to improve this score. Some of these tasks you might be able to handle yourself, others may require web developer. For any of you hungry web developers reading this, looks like ESPN might need a hand! Finally, you can use SEMRush to run a technical SEO audit of your site. With the paid version of SEMRush, you can set up projects. Within projects you can run site audits. This feature will crawl your site and again give you a technical SEO score along with items for improvement and instructions on how to fix them. As with the site speed improvements, you will most likely need the help of a developer to make many of these changes. 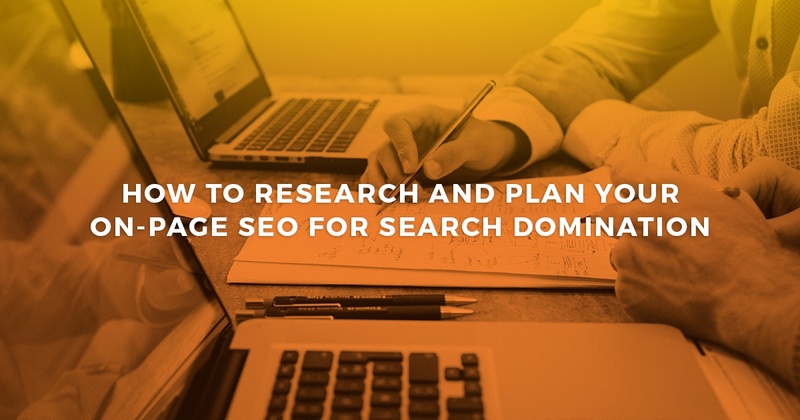 Now that you have all of your pages organized in the SEO planning template, it’s time to find the keywords you want these pages to rank for. Start by thinking of the most relevant general keyword you want each page currently on your site to rank for. 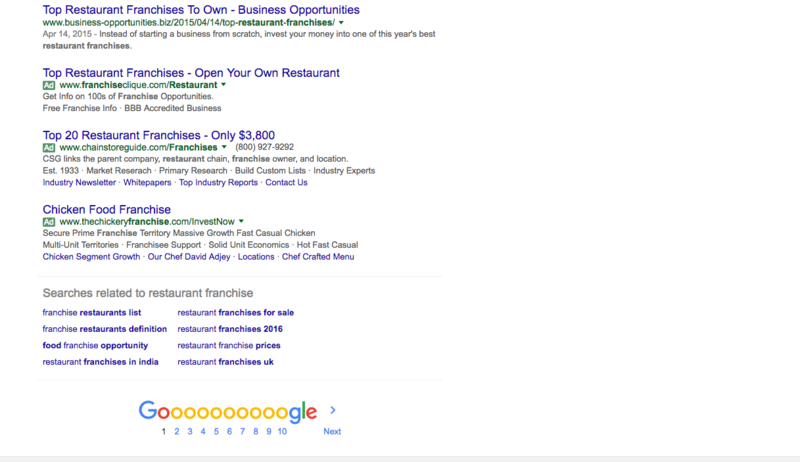 For example, a burger franchise might want to rank for the keyword “burger franchise” for one of it’s pages and “restaurant franchise” for another. You will want to repeat this process for each of your pages as they will each have a different purpose and keyword focus. 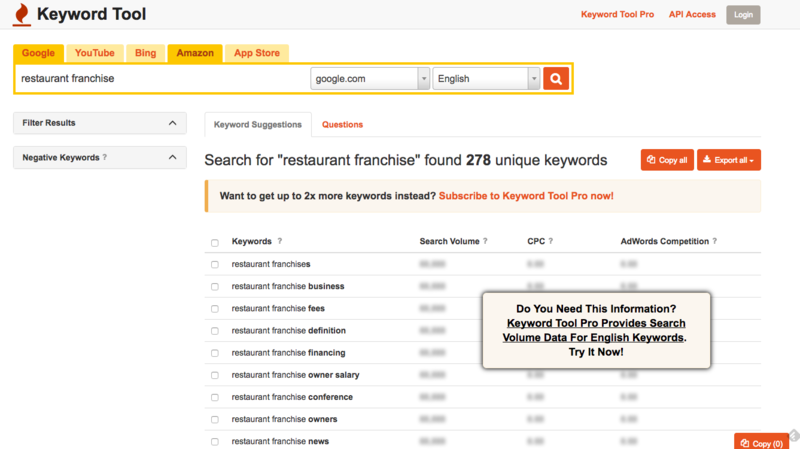 Next, take your newly created list to your favorite keyword expansion tool. I will again be using SEMRush, which is a paid tool, but for the purpose of this exercise the free version will work. You could also use Google Keyword Planner for expanding your list. Clicking on view full report will show you the top 10 searched keywords that include the original keyword you entered. Export this list. Next, in the right hand column under the main tab, “Keyword Analytics,” you will see “Related Keywords.” Now repeat the steps you took above for the “Related Keywords” and export the list. Combine the lists into a single spreadsheet. Delete all columns except Keyword, Avg. Monthly Searches, Competition and Suggested Bid. This will give you a good list of what people are searching for around your main keyword phrase. Another tactic to get a feel for the search trends around a main keyword is take a look at the automatically generated Google search suggestions and related searches. To attain these, head over to Google and enter your starting keyword phrases. Add these to your list. Now you have great insights into what people are currently searching for regarding your main topic which influence can phrases you should be optimizing your pages as well as ideas for future content. To collect all these phrases manually would take a long time. To save time try KeywordTool.io. This tool can generate hundreds of these keywords in a matter of seconds. Bonus tip: Click on the questions tab when performing a search to view common questions people ask around your main keyword. Answer these questions in the form of blog posts so that your content shows up when people ask these questions in Google. For existing sites there might be some opportunity for quick traffic wins by optimizing your current pages for the keywords where traction exists. Tools like SEMRush and the Google Search Console can help site owners quickly uncover these opportunities. Head over to SEMRush, click on “Organic Research” under “Domain Analytics” on the left-hand sidebar, type your homepage URL and hit search. 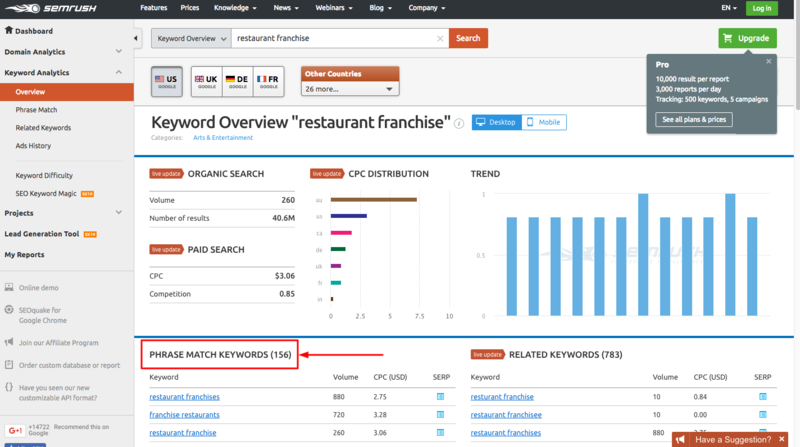 SEMRush will show you all the keywords that your site currently ranks for, their position on the search page, and the URL on your site that is ranking for that particular keyword. Keywords that present the best opportunity for increasing your organic search engine traffic are those that have a decent amount of search traffic and where your site pages currently rank in positions 11 - 30. You can also find low hanging fruit keyword opportunities by connecting your Google Search Console with Google Analytics to collect your current keyword traffic data. To find your keyword opportunities, open up Google Analytics and go to Acquisition > Search Console > Queries. This will list all of the keywords sending traffic to your website. Sort this list by descending clicks and export the list. Analyze the pages ranking for the keywords found using the two tactics above. Are they well optimized for the keyword in question? If not, it could be a potential target keyword for this particular page if the content is relevant. With a little effort, you should be able to push these pages into the top 10 for this keyword. Once you have your lists from all the sources listed above, combine the lists into a .csv file and remove duplicates. Take this list and head over to the Google Keyword Planner. If you don’t already have an Adwords account, you’ll need to create one to access the tool. 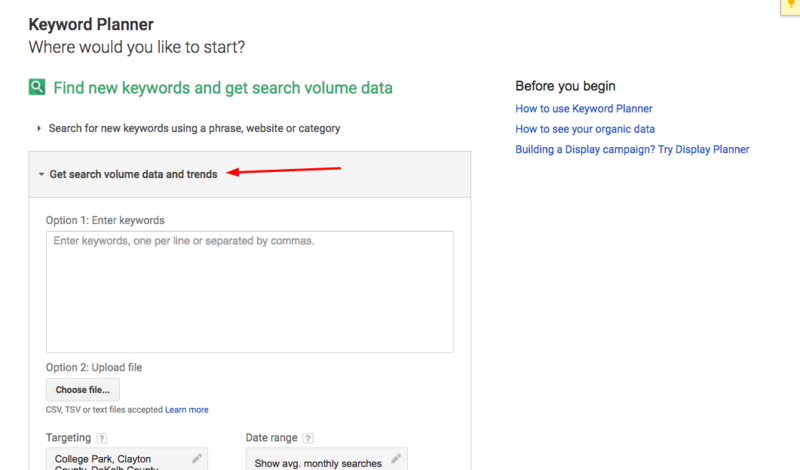 Once inside the keyword planner, click “Get search volume data and trends,” paste in your list of keywords, add any appropriate targeting filters and get search volume. 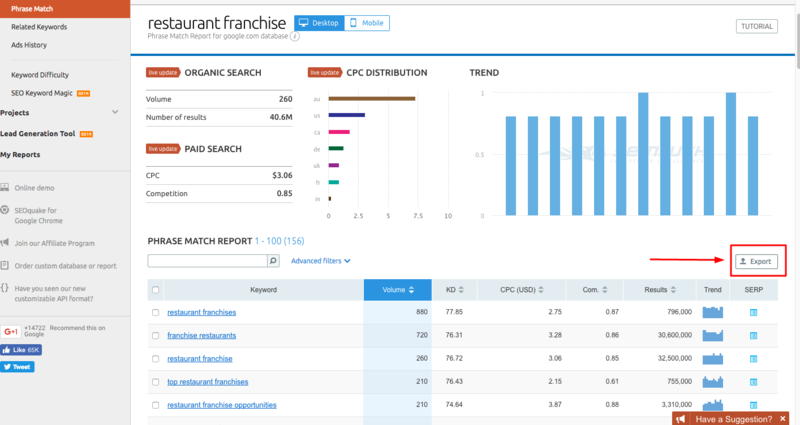 The keyword planner will bring back all the search volume data, competition, and suggested bids from the keywords in your list. Download this list. Now you’ve have a list of keywords, their search volume data, and their level of paid search competition. Find the keywords that have decent search volume and medium or low competition. The competition metric isn’t completely accurate because it’s referring to paid search competition not organic search competition, but it can be used as a reference. To get a more accurate idea of how competitive organic search is for a keyword phrase, plug the phrase back into SEMRush and take a look at the “Keyword Difficulty” score. If this score is too high, you might want to choose a less competitive term to optimize. At this point you should have a primary keyword phrase (a broader phrase with two words) i.e. 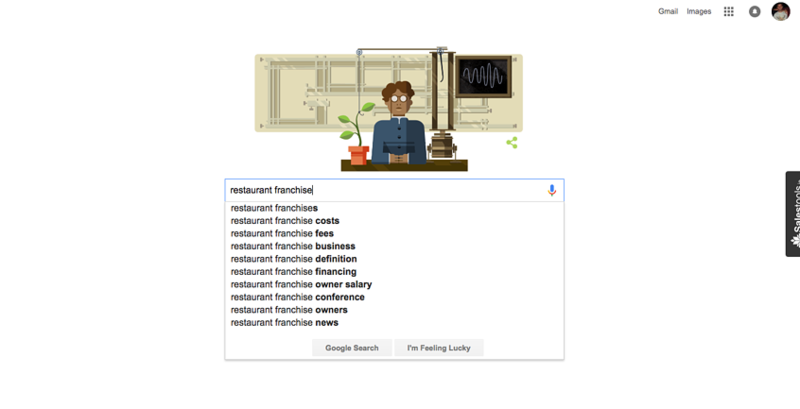 “burger franchise” and a secondary long-tail keyword phrase (includes primary keyword phrase and has over three words) i.e., “start a burger franchise” for each individual static page on your website. Now fill in the new optimized data in your SEO planning template using these keyword phrases. For the title and description columns of the SEO planning template, the idea is to create compelling copy that entices a person searching for your target phrases to click on your page as opposed to competitors. Remember to keep title tags under 70 characters (under 55 recommended) and meta tags under 155 characters. For the title tags, and meta descriptions it’s important to include your target keyword phrases, ideally without sacrificing readability. You’ll also want to include your target phrases in the columns for target keyword, headers, subheaders (don’t sacrifice readability here), filenames and alt tags for images on the page, and any anchor text for links pointing to this page from internal and external pages. Save the completed SEO planning template in an accessible folder on your computer for future edits. The final step is to transfer all the new data from your SEO planning template to your webpages. This is as easy as copying and pasting, but you may need to recruit your webmaster if you’re not familiar with the process. Now you have a roadmap showing you the exact initial SEO setup process that we go through for each and every one of our clients. Once you have completed all the steps in this post, you will have a firm foundation from which to expand your search engine visibility and organic search traffic through content marketing and linkbuilding which will discuss in later posts. Was this post helpful? What do you think about our process? Did we miss anything or would you add any tweaks? We would love to hear from you. Please leave your comments below and let us know of any other topics of interest.